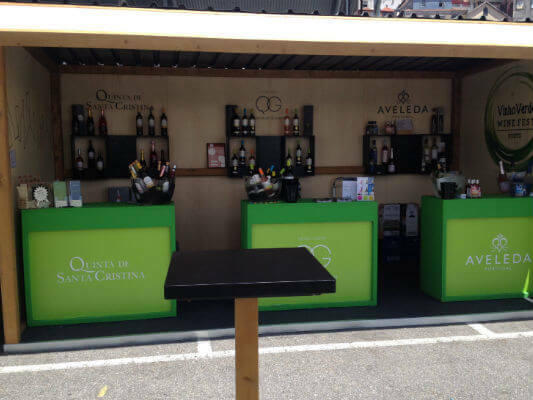 Quintas de Caiz is a very recent project in the Portuguese wine panorama and it’s in the middle of the Vinho Verde region. A fruit of the passion that the Freitas have for the earth as well as the desire to create something unique that would also be a good product of that region, and specifically the hillsides through which river Tâmega slithers. 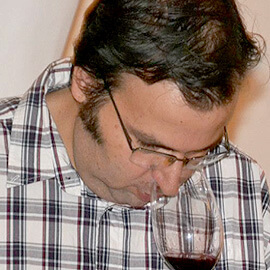 The three wines by Encostas de Caiz in this tasting were all from 2014 – the same first harvest that was put on the market. Restless wines, still nervous from having been recently bottled; not long before they came into my hands. Again, I repeat, the wines from this region generally benefit from one or two years in the bottle; more than enough time to set their anxhiety aside when they appear to be free from the shakes or memory loss. Just a whiff of fresh air and everything was back to normal, making the tasting quite reassuring of the quality of these new Encostas de Caiz. 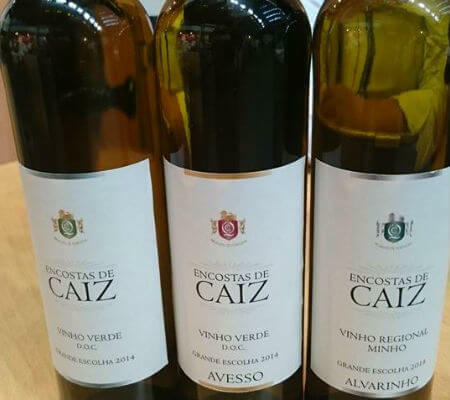 The first wine to be tasted was Encostas de Caiz Grande Escolha 2014 of a lot composed of Alvarinho and Loureiro. 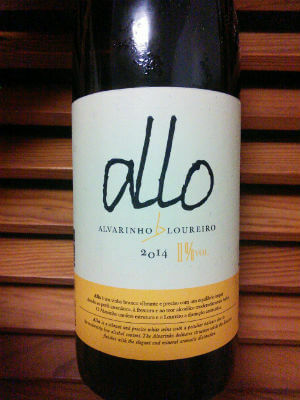 It spoke the least out of them all, given that Loureiro was completely dominated by Alvarinho, and the blend needs time seeing as everything is still very tense and in a tuning stage. Nonetheless, it appears wrapped in freshness, with enough strength to unwrap by itself during the next couple of years. Encostas de Caiz Grande Escolha Alvarinho 2014 was better, although it did also reveal a need to age in the bottle a little longer. Very fresh and sharp in aromas and flavours, quite a tight blend, tense, seamlessly tropical, dominated by very ripe fruits from the orchard wrapped in freshness with hints of flowers and the mineral austerity dominating in the background. For the end, the one I liked best, the most pleasing and quickest to disappear out of the bottles, Encostas de Caiz Grande Escolha Avesso 2014. It immediately wins you over with a combo composed of lightly exotic fruit with a touch of pear and citrus fruits joined by a floral aroma. Perfumed and inviting, it reveals a background marked by minerality, a very good ability to revitalise the palate with oriental-style meals, where the seasoning usually rules. 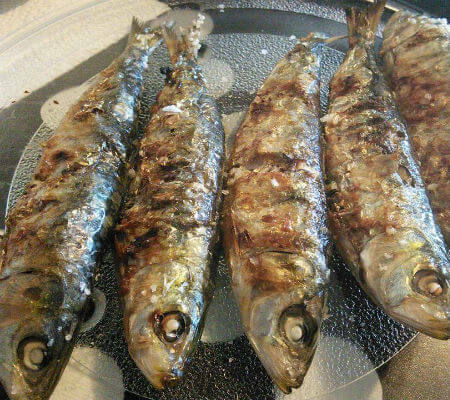 In this case, every wine served to accompany beautiful sardines roasted on coal. Quinta de Santiago, on the doorstep of Monção, right in the middle of Monção and Melgaço sub-region, the first-choice land for Alvarinho wine. This very ancient property has been in the same family for several generations, and it’s also where Alvarinho grapes have been growing. The present owners’ daughter, who makes a living as a lawyer, is responsible for producing and distributing the farm wines, a passion that arose unexpectedly, albeit with a very peculiar explanation. 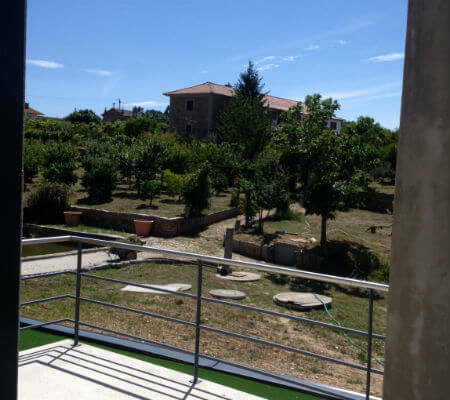 Joana and her brother used to spend their holidays apart; he would stay with one pair of grandparents while she would stay at their grandparents who lived in Monção, that is, in Quinta de Santiago. 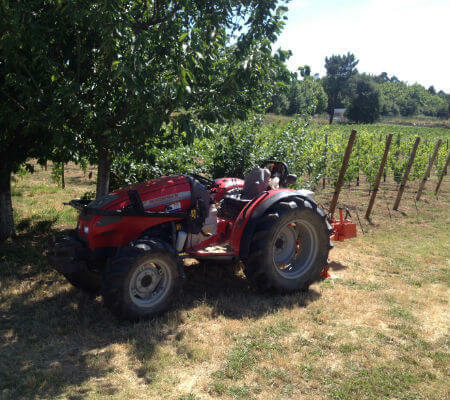 And that’s when her love for the land started; she learnt how to recognize the aromas, to pick fruit and vegetables and, when time came, she watched the harvest, and the grapes being crushed, at the same time helping around and getting everything ready for the new wine to be well prepared. The bond with her grandmother grew stronger. At the time, her grandmother used to sell the wine to local coffee shops and grocer’s, keeping a small amount for their own consumption. When new rules and regulations were passed, her grandmother started selling the grapes, putting a certain amount to the side in order to produce her own wine. Although it was Joana’s father’s dream to produce wine for the market, it was her grandmother who, at the age of 86, challenged her son and granddaughter to work together to plan a project for the production of her wine. 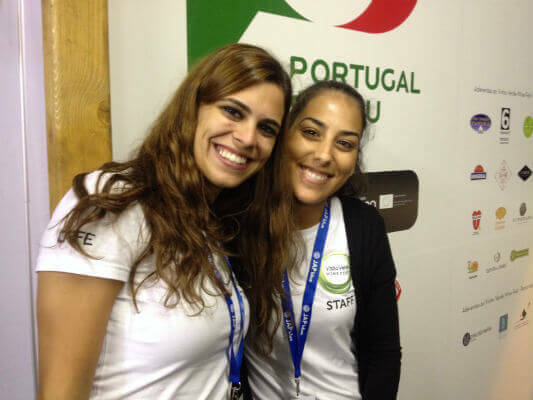 They both took her advice and that’s how, in 2009, the project of Quinta de Santiago came forward. 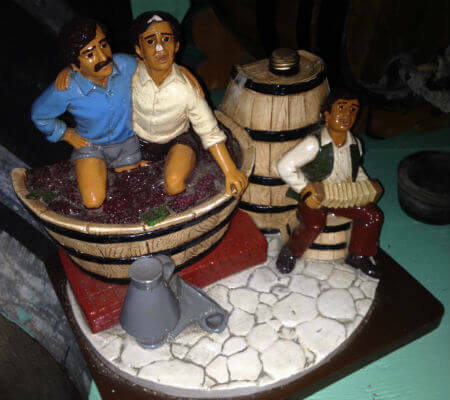 Their first wine turned up in 2011. 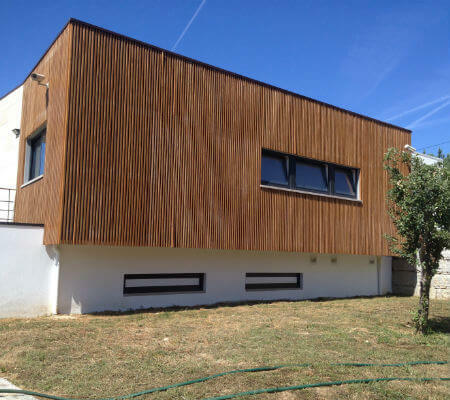 Nowadays, Joana Santiago lives with her husband in Ovar and splits up her daily life between her job as a lawyer and her job as a producer of wine in Monção, where she recently opened up her new cellar, sketched and built by her husband in record time. 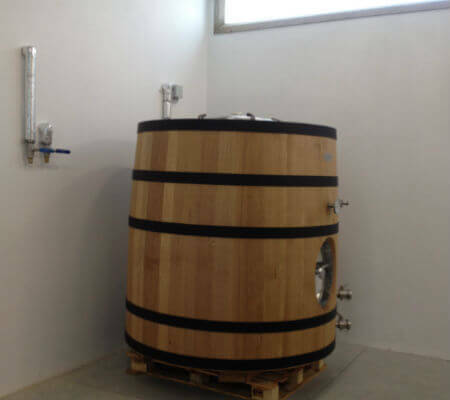 Modern, very practical and well equipped, this cellar is Joana’s new addiction and she spends as much time as she can there, following every step related to the production of her two wines: Alvarinho and Reserva. 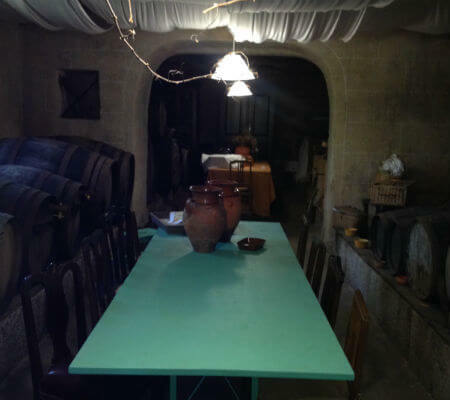 However, she reserves the old cellar underneath the old living quarters for wine tastings and group meals. Fairs, festivals and competitions are all part of her present life, some all over Portugal and even abroad where her wine, filling 15,000 bottles a year, has been well praised. 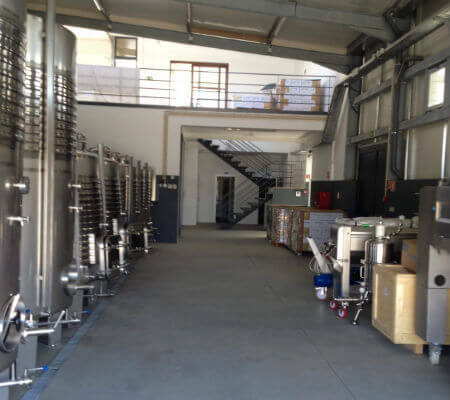 Nowadays, her wines are a big hit, highly appreciated, besides constituting an actual business, which Joana proves to be the leader of, and the person responsible for this life-project. 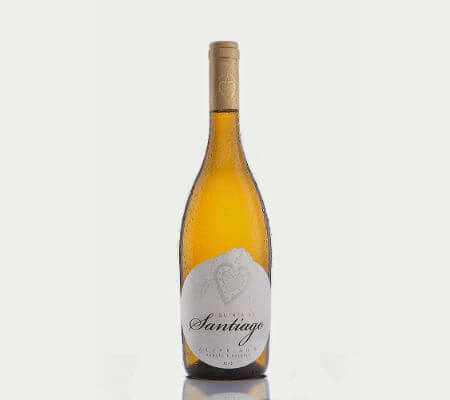 Quinta de Santiago Alvarinho 2013 is a typical Alvarinho, showing lots of minerality, loads of tropical fruit (a quality of these wines), citrus, peach, passion fruit, and tonnes of mountain flowers. On the mouth it maintains the intense flavour of the white fruit; it shows freshness and excellent acidity, beautiful volume and it always has the characteristic minerality. 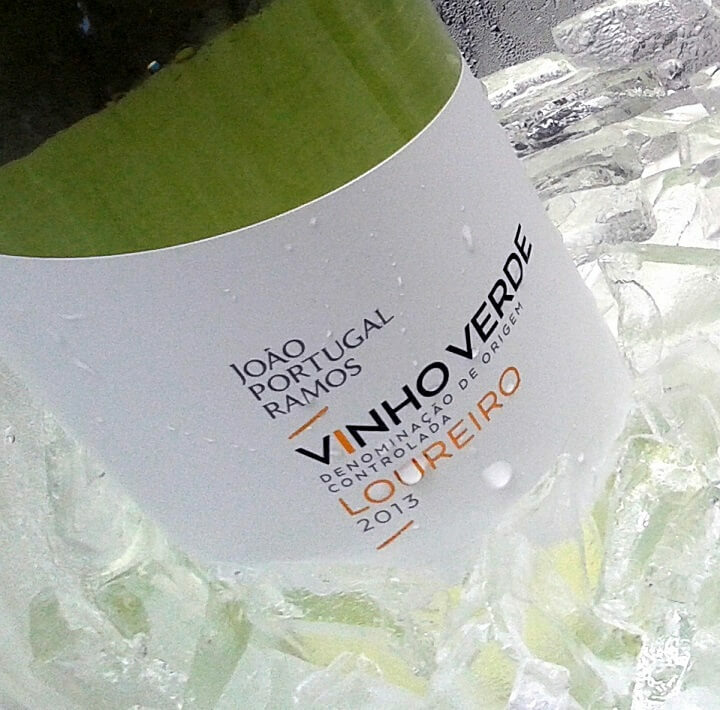 All this makes this Alvarinho a very elegant wine. Quinta de Santiago Reserva Segredo da Avó (“Grandma’s secret”) 2013, is a serious wine, full of complexity on the nose, still revealing some exotic white fruit, soft smoky notes, slightly toasted, confirming that it was aged in casks. On the mouth, it shows structure, it’s full and elegant at the same time, persistent, fresh, with lively acidity, still revealing ripe fruit and light notes of spices, and always that delicious minerality in a very gastronomic wine. 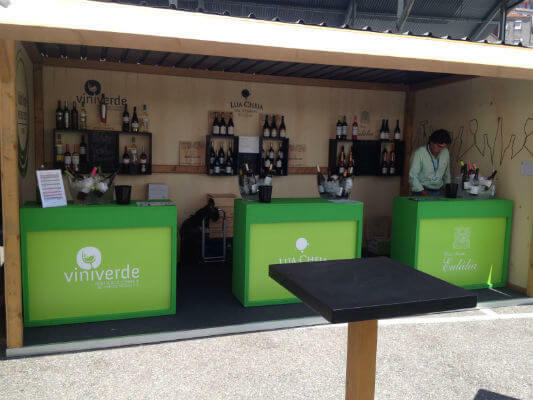 Vinho Verde Wine Fest… A party like no other! This year was the second edition of a festival that is here to stay. 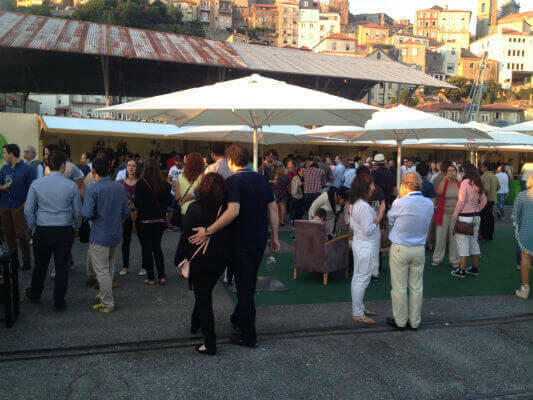 A few changes have been made since the first one happened in 2014, and the festival was moved to the outter East wing in Alfândega do Porto, thus gaining twice the space as well as a car park for exhibitors. This makes for more and wider eating areas, and an additional central square with a lot of tables and chairs. 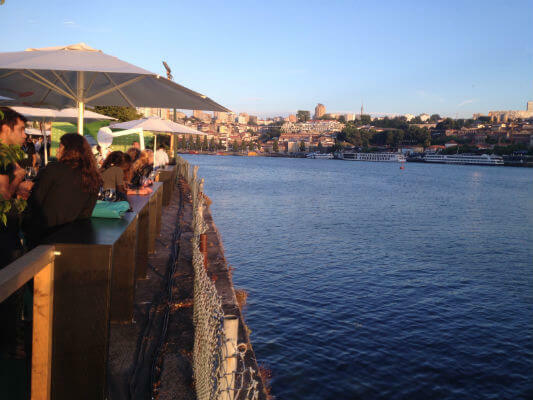 Besides the ever present Douro river, a landmark in a unique landscape, the weather also helped, even in the evenings, with very mild temperatures extending the enjoyable conversation while holding a glass of vinho verde. We had four very intense days with the 30 producers offering tastings of more than 200 wines; at the cocktail counter, they prepared very interesting suggestions, for example a cocktail mixing a verde red of the Vinhão variety, which turned out to be amazing. No wonder the queue was sometimes huge!! 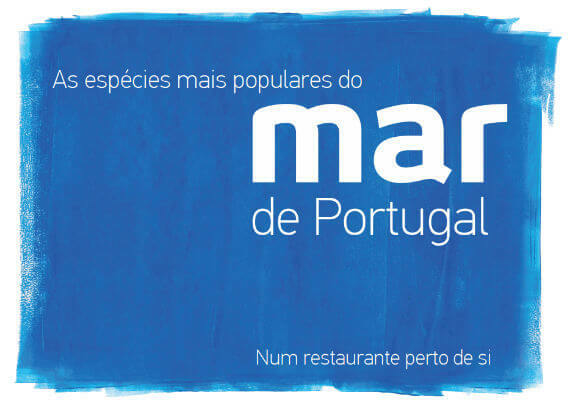 On top of it all, the five restaurants and the four small taverns there produced enough to cover every order, from sushi to suckling pig sandwiches, including traditional delicacies, original food, pregos (steak in a bun or on a plate), hamburgers and bifanas (pork-steak sandwich), presunto (Portuguese prosciutto), and even pão de ló (sponge cake). In the meantime, as soon as the doors opened, the commented tastings began. They were split into two rooms, always full, given the ever higher interest of a better and better informed audience. 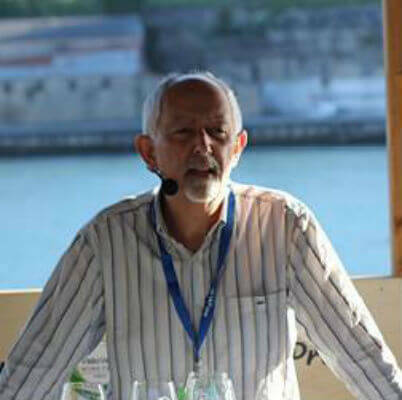 In fact, they also have the chance to try a few new things, presented and commented on by the oenologists themselves, which enables direct dialogues with the wine makers, who always have a lot to say. Some tastings were commented by journalists specialised in this sector; this time, we were graced by the presence of two prestigious journalists from Revista de Vinhos: Nuno Garcia and the editor himself, Luís Lopes. 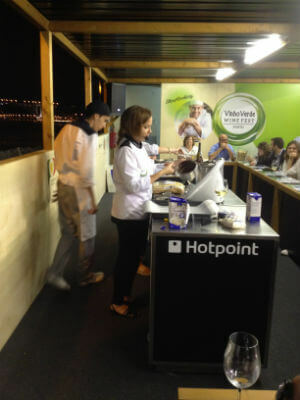 On the other side of the exhibition site was a room where only cooking shows took place. They had as many as 20 shows in four days! I had the privilege of attending them all, and for each I suggested two wines which would harmonise with whatever the chefs produced. Something special happened here on the first day: the presence of Emilia Jackson, the celebrated chef who finished third in Masterchef Australia. 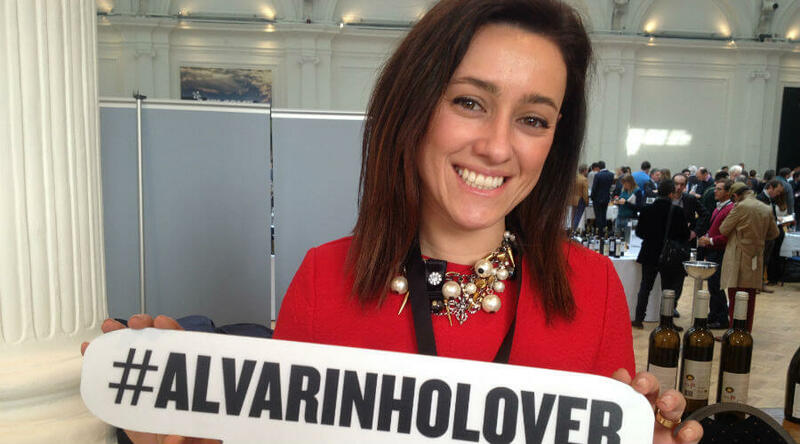 She is a friendly Australian living in London, and was assisted by the lovely Joana, who also came in third, although in Masterchef Portugal. Of course the entire audience was there, and complained to the organisation about the lack of seats. 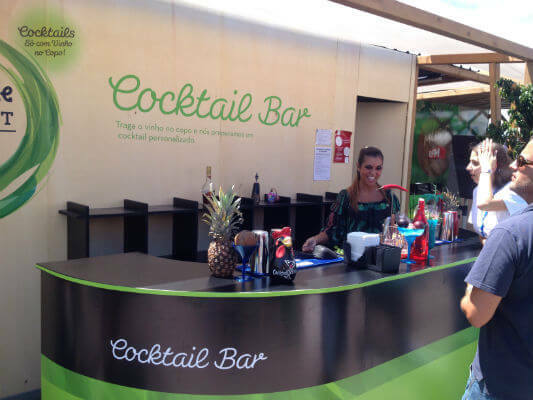 To create an excellent environment, they played a very well-chosen selection of music, which was turned up in the evening to get our glasses twirling and a real party mood going, because that’s exactly what it was, the vinho verde party. 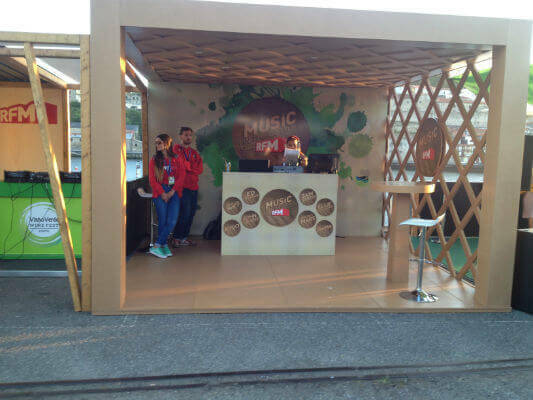 RFM (Portuguese radio station) was always there, interviewing and giving out information, mostly live, and also getting many more people to the festival. 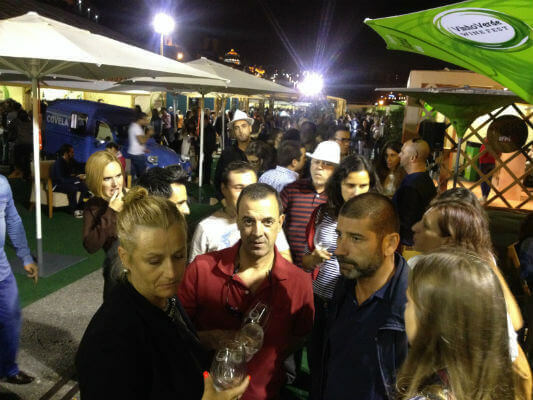 People of all ages were there, but it was mostly interesting to see young people enjoy a lot of vinho verde, munching on nibbles and mostly having fun and bringing a touch of healthy youth to the festival. 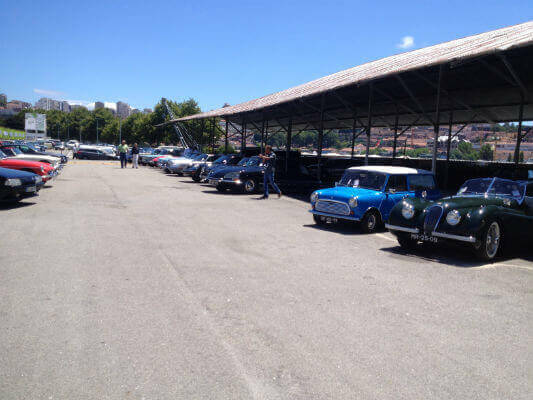 On the last day, Sunday, the car park was “invaded” by 120 old cars, creating a beautiful environment, which also attracted a lot of people. Doors closed at 8.00pm, but it was almost 10.00 when the party actually ended! 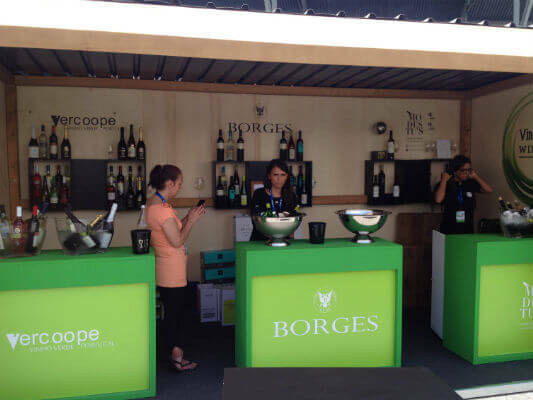 I would like to congratulate Comissão dos Vinhos Verdes, their president, and the entire team of professionals who were there all the time, playing their part in the event. The promise of next year’s edition was broadly advertised. I went back to my origins, to the land where I was born (Vila Viçosa), and this is where I have been spending the last few days, enjoying a sort of mini-holiday. I have used this time to rendez-vous with and revisit old friends, as well as to once again see my hometown I missed so much. Therefore, it’s expected, and also natural, that the best of these moments take place at the table, where besides cuisine, we also share wine and a good mood. At the meal I attended last evening, many were the wines that joined us at the table. It was curious to see that with almost all of these wines, as they were served, they were welcomed with the most varied comments. Here, as anywhere else, there is a moment when you only drink and chat, when the wine in question seems to be forgotten, even mistakenly, and misses the discussion shared between those present. That wine suits the taste of all those present, in a generalised consensus; it pleased them so much, nobody even mentioned it. We usually say “he who doesn’t speak agrees”, hence the silence. 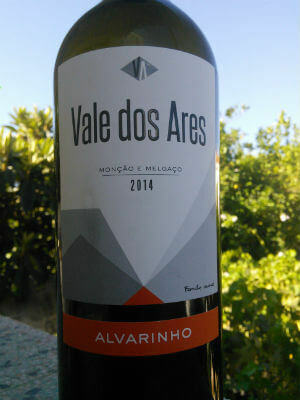 One of those wines was Vale dos Ares Alvarinho 2014, from the region of Vinho Verde, produced by Miguel Queimado (MQ Vinhos) and oenology by Gabriela Albuquerque. This Alvarinho is not easily tempted; it does not exceed in exoticism, nor does it lack assertiveness; it lives somewhere in-between. But living in-between doesn’t mean it lacks character; not at all. It’s elegant, knows what it wants, proves serious and convincing, wrapped in a beautiful fresh fragrance. Elegant and harmonious, refreshing and inviting, it improves after some time in the glass, making a refreshing mouth tasting marked by the fruit, balance and steady structure, although flexible, because the wine seems to mould to our palate, much due to the bâtonnage it underwent. Nothing to add, of course, except for what somebody at the table said: Is there any more of this one? This farm holds more than four centuries of history, going back to the 1600s. Many fables and stories tell of its birth, many of which told by its own surroundings – from the old palace to the caves, including the lake, gardens and vineyards. It amounts up to about 40 acres in total. The walls around the farm refreshed its soul in 1976, when it was acquired by the current owners. To the day, it remains a 100% family business, and is already in the second generation, ensuring the project’s continuity. 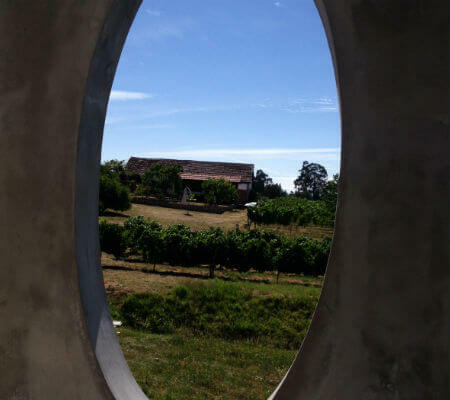 The vineyards are already following fair trade guidelines, and spread out over 66 acres across four pieces of land in Forjães, Ponte de Lima and Barcelos. The Atlantic and the granite-rich grounds brand the wine’s profile. 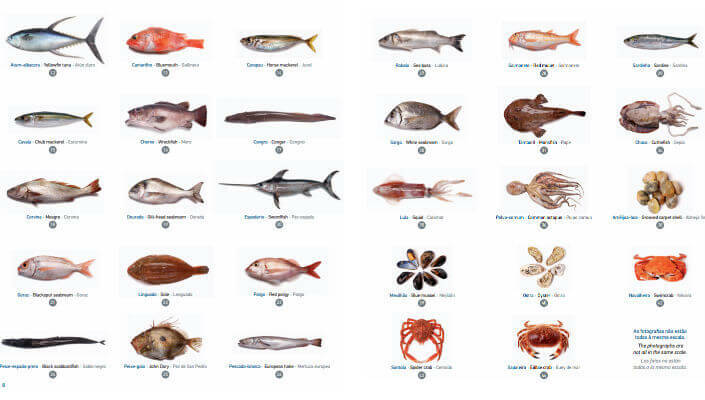 We were able to confirm this when tasting three samples of the Afectus range. This range of wines has been inspired by the affection and passion for the land, and its labels’ image represents the century-old camellias in Quinta de Curvos. 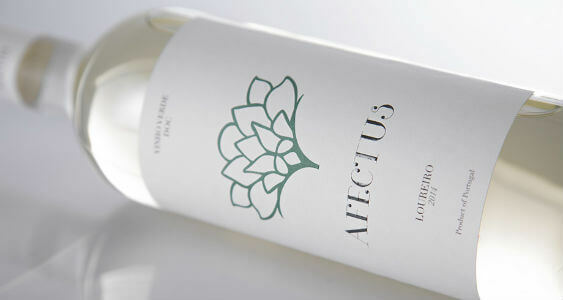 Afectus Loureiro 2014 (Vinho Verde) caused the least impact out of the three wines. It was refreshing and stood out for the fruit (red apple and red peach), and although not too exuberant, it combines aromas of linden flower, bay leaf and flint in the background. With a well-balanced acidity in the tasting, the fruit displayed good presence in an average finish. 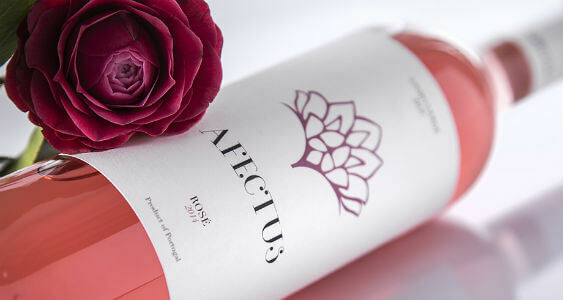 Although the other two wines are Vinho Verde, Afectus Alvarinho 2014 reminds you of a Regional Minho. More austere than the former, its aromas are more outlined and have stronger presence, and the freshness imposes its notes of lychee, peach, lemon and lemon balm. Somewhat closed, it implies that more bottled time would only benefit. In the mouth, the fruit has good presence, the lychee highlighted on a par with a very ripe and juicy peach; the background is refreshing and flavourful with a very faint mineral austerity. 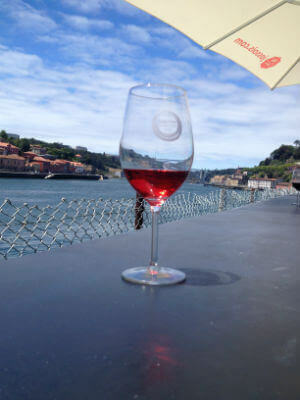 This Rosé was a joyful and refreshing surprise that poured into my glass; to it belong the region’s characteristic varieties: Vinhão and Espadeiro. The wine pulls you in with its freshness; with the way the plump and juicy fruit (strawberry and cherry) pours flavour while the background proves dry and mineral. All of the above appears wrapped in a thin layer of smoke, in a wine that has all it takes to shine in the nearing heat peak. By the way, try it with grilled meat: the result is amazing! 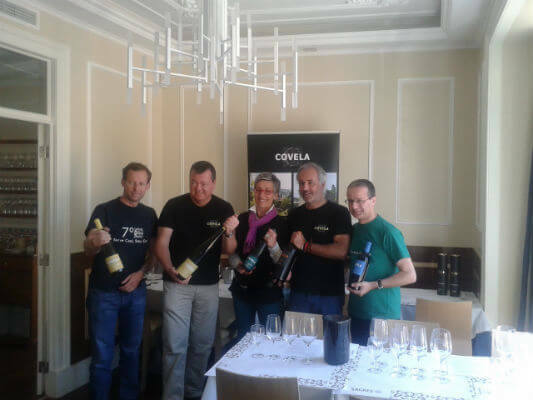 On the 22nd April, Quinta de Covela came to Lisbon to present their wines harvested in 2014. 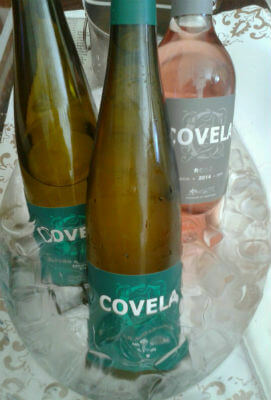 The tasting of the single-species and the Quinta da Covela rosé was held in one of Lisbon’s icons in cuisine, Cervejaria Ramiro. Following an introduction by viticulturer Gonçalo Sousa Lopes and oenologist Rui Cunha, we were guided by the entire team. 2014 was a very good year; it rained at the right time, alternating with heat, which slowed the ageing of the grapes down and, I dare say, perfectly. The result is out: refreshing wines of very defined, crystal clear scents and flavours, and a natural inclination to be served with food. 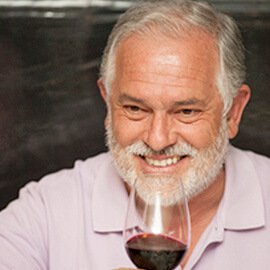 Demand for these wines is on the rise, while its current production is still low, given the necessary replantation because of the bad state in which about 40% of the vineyard was found. First of all, there was a mano a mano between the Covela Avesso Edição Nacional, of the 2013 harvest (magnum bottle) and that of 2014. The difference was a more serious and cohesive Avesso 2013, much fatter fruit (citrus and apple) with undefined aroma, of a slightly austere combination in the mouth and a dry aftertaste. Covela Edição Nacional Avesso 2014 shone with very pure, almost crystal-clear aromas, a very floral and perfumed touch, the fruit in the spotlight; very refreshing and charismatic, and somewhat mineral in the background. 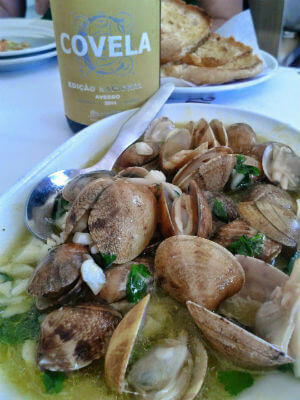 This cohesive combination is full of life, has a lively mouth and a very tasty, dry aftertaste, which goes well with food, which was to be served next: the wine proved quite graceful together with Amêijoas À Bulhão Pato (Bulhão Pato-style clams). The next wine reveals an Arinto-like tone; very austere and energetic, this new Covela Arinto Edição Nacional 2014. It is very refreshing within such a new combination. The base is citrusy with some floral, although the whole mix still needs some more time. For now, the mineral tone in the background is the most enhanced feature thanks to the energy it creates in the mouth. 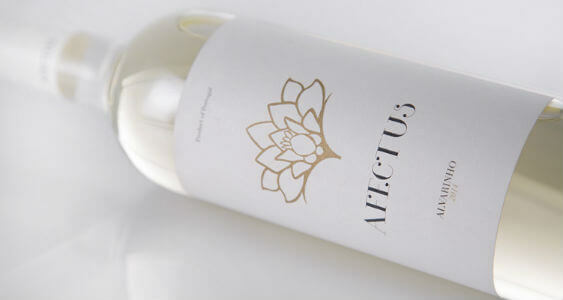 This white has a good athletic build, while being quite less playful with aromas than Avesso. In this case, perhaps more substantial meals are in order, as was proven with Gambas al Ajillo (Ajillo-style prawns). Another new product is Covela Rosé 2014, made from Touriga Nacional, which is prematurely harvested especially to make this wine. A successful case and one of the best rosés made in Portugal, its winning features being youth, freshness and gentleness; very detailed scents and flavours, a delicate floral with that remarkable freshness. A balanced fruit-acidity palate and a pleasant presence, maintaining that dry aftertaste in the mouth, which revives the palate and makes for great potential in cuisine.